The canvas was located at an auction in Germany, in a small auction house called Eva Aldag in the town of Buxtehude just outside of Hamburg. The Aldag auction house has specified Orange Woman as being "no doubt the painting of Gierymski". The photograph in the catalogue, in comparison with the only other image in existence (a black-and-white photograph taken pre-war) essentially differs, which must have raised doubts, whether it really was an original Gierymski. Above all, in the pre-war photograph, the basket hung on the left arm of the old woman hardly reaches the edge of her clothing. 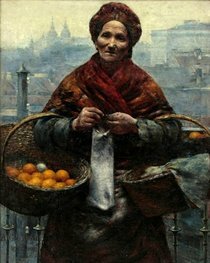 In the picture from the auction catalogue the edges of the basket reach far down the orange seller's outfit. The signature also aroused suspicion, it did not look dated. The neck also appears different, as does the shoulder and painted over elements in the background. And the measurements provided by the German auction house , 65 x 54 cm, are slightly smaller than the pre-war descriptions of the artwork. If the "Orange Woman" was found through legal trafficking means, it would not havecost less than 1.5 million zlotys. It is only because intense downturn is currently at large on the global art market. In the good old days it was hard to imagine an auction, where this piece would not fetch a figure of around 2 million zlotys. In all likelihood, even as a plundered work, whose keeping and re-sale are illegal, it is worth between 500,000-800,000 zlotys on the art market. Art appraiser Marek Mielniczuk has also spoken out about the authenticity of the canvas. Twelve years ago he recognized another Gierymski painting (The Louvre by Night) in a provincial French auction house, which was subsequently bought up by one of the banks for the National Museum in Warsaw. In all likelihood, the differences between the pre-war photograph and the auction house image result from bad conservation carried out shortly after the war, he says. The painting suffered many losses, which were not expertly done over with paint, but only with ordinary re-paints. "There is no doubt that this is the original work of Gierymski, stolen from the National Museum in Warsaw during the Nazi occupation", says Mielniczuk. The circumstances of the robbery remain unclear. After the war all traces of the painting were lost. In Polish literature the masterpiece was written up precisely as having been robbed from the museum's collections. It appears that the German art appraisers from the provincial auction house were unaware of this. They explained that grandmother of the current owner of the offered painting married in 1948 an art collector industrialist from Düsseldorf, who was the painting's previous owner. From that time on, the painting fell into the hands of subsequent family heirs. Despite the extensive re-painting, the artwork lost nothing by way of artistic valor. Expert conservation work can still save it. It is still not clear, however, what the chances are of its being re-claimed by Poland. Gierymski's painting was supposed to have gone to auction November 27, 2010, but the auction was called off after the intervention of the Polish Ministry of Culture and the National Museum in Warsaw. Eva Aldag, the owner of the auction house, received a letter with a plea to first conduct research into the authenticity of the work. In her opinion, the painting could land in a future auction set for February 2011, after it is put to the analysis of experts.